Contains: 1.2 extract of Cimicifuga racemosa root in 59-61% organic cane alcohol, distilled water, and vegetable glycerin. Contains: extract of Salvia miltiorrhiza root 1:3 in distilled water, organic alcohol, and vegetable glycerin. Contains: extract of Angelica sinensis root in organic alcohol, distilled water, and vegetable glycerin. Contains: standardized extracts of Shatawari (Asparagus racemosus), Ashwagandha (Withania somnifera), Cumin (Cumimum cyminum), Pipli (Piper cubeba), Caryophyllus aromaticus, Nageshkar (Mesua ferrea), Purnarnava (Boerhaavia diffusa), Bombax malabaricum, Ginger (Zingiber officinale), Guggul (Cedrus deodara), Hibiscus rosa-sinensis, Hygrophila spinosa, Vasak (Adhatoda vasica), Ficus bengalensis, Nelumbium speciosum, Andropogon muricatus, Haritaki (Terminalia chebula), Byronia laciniosa, Indian gooseberry (Emblica officinalis), Lodh tree (Symplocos racemosa), Ashoka (Saraca indica). Contains: standardized extracts of Ashoka (Saraca indica), Karela (Symplocos racemosa), Anantmul (Hemidesmus indicus), and Shatawari (Asparagus racemosus). We have been using this formula on a trial basis for almost two years now. Feedback has been excellent. 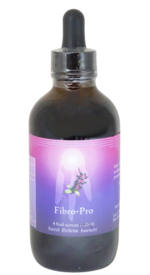 The formula is adaptogenic and strengthening and tends to ease pain associated with fibromyalgia. Contains: Proprietary blend of Angelica archangelica root, Atractylodes macrocephala root, Filipendula ulmaria herb, Tanacetum parthenium bark, Piscidia erythrina bark, Ziziphus spinosa fruit, and Withania somnifera root in distilled water, organic alcohol, and pure vegetable glycerin. Contains: Proprietary blend of Glyycyrrhiza glabra root, Paeonia lactiflora root, Taraxacum officinale root, Urtica dioica root, Chamaeliriun luteum root, Oplopanax horridum root bark, Serenoa serrulata fruit, Smilax ornata root, Vitex agnus-castus berry, and Anemone pulsatilla herb/flower in distilled water, organic alcohol, and vegetable glycerin. Contains: extract of Trifolium pratense flowering tops in distilled water, organic alcohol, and vegetable glycerin. Contains: Dioscorea villosa, fresh root and organic grain alcohol.